January 31, 2019 By Erika C.
Earlier this month, Pompano Beach Middle School received a makeover of a different kind – a sustainability makeover. Through sponsorship from Advanced Roofing and coordination through HANDY (Helping Abused Neglected Disadvantaged Youth), Pompano Beach Middle School will launch its first-ever aquaponics garden with a brand-new AquaGrove system. 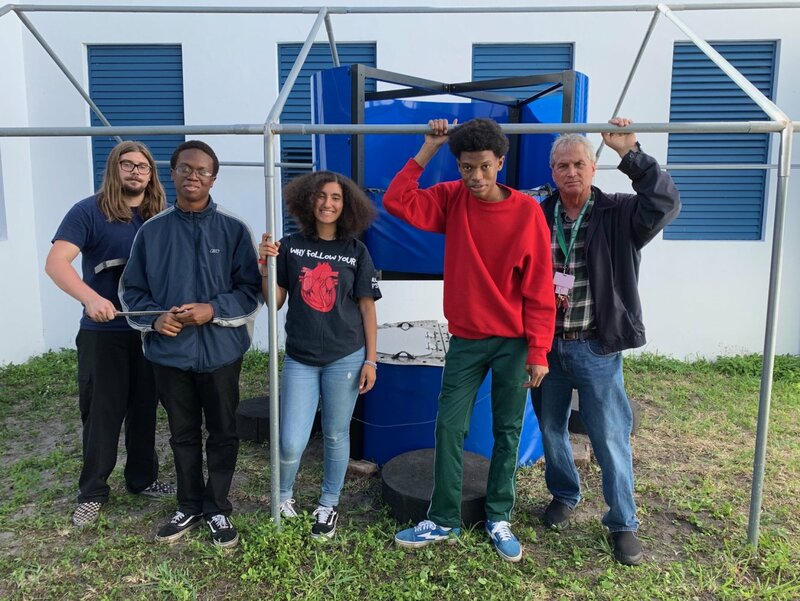 Being new to aquaponics, the school was seeking partners to help them get started, and fellow AquaGrove growers at McArthur High School in Hollywood, Florida stepped up and volunteered their time and energy to make it happen. Led by Vincent Newman, McArthur High School’s award-winning Science teacher and recipient of the Dupont Pioneer Excellence in Agricultural Science Education Award, a team of experienced Future Farmers of America students (Eric Novak, Daniel Thomas, Jamal Supplice and Mya Morales) took time from their winter vacation to assemble the AquaGrove. The team from McArthur High School was able to complete the assembly of the system in just a few short hours on the morning of Monday, January 7, 2019, having it ready for Pompano Beach Middle School students as they returned from the holiday break. Moving forward, the teachers at Pompano Beach Middle School will oversee the AquaGrove learning program and system, while students will be empowered and engaged in daily lessons through tracking water levels, feeding fish and measuring vegetation. Teachers and students are looking forward to getting the system cycling and operational soon so that they can begin raising fish and harvesting plants. Pompano Beach Middle School plans to integrate the food grown in the Aquagrove back into the community and school by creating a mini-market for kids; the mini-market will sell to parents and families at a very low cost, as well as donate produce through partnerships with homeless shelters in the community.